Wix is an all-around player in the website-builder field. You can build your company’s website in a matter of minutes thanks to Wix’s Artificial Design Intelligence, or invest a little more time and create a highly customized, modern and professional looking website through their first-class platform. And the best part: the drag-and-drop builder requires no experience with or knowledge of code. If you do have coding experience, however, Wix users can now fully access their site’s code- thanks to Wix Code- allowing them to create some of the most customizable sites on the web. Business owners from all industries can choose from over 500 beautifully designed and highly functional templates or start building their site from scratch with Wix’s blank canvas editor- a great option if you want to take more control of the creation process. If you are looking for the website builder that has it all, Wix truly is the best option. But take note: Whilst the innovative tools and features that are constantly being added take the hard work out of the website creation process, you should be prepared to spend some time familiarising yourself with all of these elements (and the endless options the builder has to offer) to get the most out of the Wix platform. In 2016, Wix launched their Artificial Design Intelligence which rightly deserves a mention and is therefore touched on below, followed by our comprehensive Wix review which examines their main website builder. There is no denying Wix is one of the most innovative website builders, but when it comes to their Artificial Design Intelligence (ADI), they have officially hit the ball out of the website building park. Using their 11 years of experience with sites built by over 100,000 million users, Wix’s ADI only requires basic knowledge about your business in order to build a tailor-made site in a matter of minutes. Select design style (there are 6 suggested designs to choose from, but you can change them later). Once you have completed these answers, Wix ADI creates your site at a ‘blink and you’ll miss it’ speed. The first result with the ADI is quite impressive and the more you use it, the more you will be amazed. Not only has the builder selected relevant images, but also created text that is targeted to my business type and potential customers. Certain elements of the design or content may not be to your liking, and the ADI expects that, which is why it has a step by step guide to walk you through the editing process. At each stage of the editing process, Wix ADI again offers to change the chosen element for you or allows you to make the changes yourself. If you choose to let the ADI make the changes, not only does it do them in front of your eyes, it hovers over the editor menu and shows you where you would need to click in order to make the exact same changes yourself. This step-by-step process of the ADI editor and its method for teaching the user makes it an incredibly useful tool for first-time users of a website builder who are perhaps less tech-savvy. For those users who are looking for more control, or feel comfortable to build their site from start to finish, we recommend using the original and powerful Wix editor. With over 500 uniquely-designed and professional-looking templates to choose from, you are bound to find a template that matches your business needs with Wix. Browsing through their range of templates, from ‘Business’ to ‘Online Store’, ‘Photography’ to ‘Restaurants’ and ‘Blog’ to ‘Accommodation’, it’s easy to understand that Wix has invested heavily in the design of their templates, not only from a quality perspective, but to offer designs that are clearly tailor-made for the widest range of industries of all website builders (there are 16 main categories of templates and over 70 unique sub-categories to be precise). This is really helpful for business owners who aren’t quite sure how to start building their site or what elements to include or just don’t have the time to really plan out the look of their website. But for those with a clear concept and design plan in mind, Wix also offers a blank canvas editor, allowing you to enjoy the convenience of their drag and drop builder to create your site from scratch. Wix’s template library may seem overwhelming at first, so make sure you take the time to open some of the templates to get a real feel for the website’s design and functionality. You can hover over any template in the library and click ‘View’- scroll through the home page, visit internal pages, play with the elements on the site and switch between the mobile and desktop views to get the best impression of your future website. Take note that whilst the majority of templates are free, certain templates fall under a different pricing category, such as a selection of (but not all) ‘Hotels’ and ‘Ecommerce’ templates. TIP: Taking the time to play around with the templates and being confident of your choice will save you time down the track. Once you start editing your selected template, you can’t change to a different template. (This can only be achieved by opening a new template and copy/pasting your content into the new template). TIP: When publishing templates that include business solution apps, such as Wix Stores, Wix Hotels and Wix Restaurants, you will need to upgrade to the relevant Premium Plan in order to access additional features. Once you have selected your template, you will be taken to Wix’s site editor- or, as we like to say – where the real fun begins! Whether you are a first time user, or slightly more advanced, you will find the interface easy to use, with an endless list of elements to add, edit, customize or remove from your site. 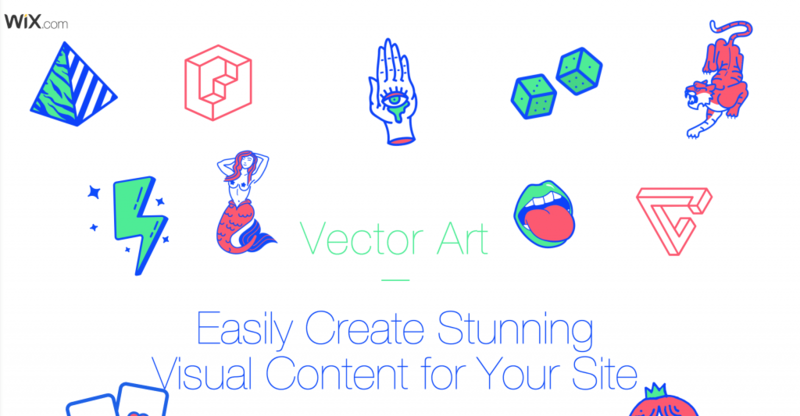 Users can also access over 3,000 illustrations, icons, logos badges and more using Wix Vector. This service is free of charge. Choose between 40+ filters, ranging from vintage to bold duotones. Users can also add videos to their YouTube channel and see them instantly on their site as well as sell, rent or offer monthly subscriptions, free of commission. The Editor Toolbar that sits on the right of the editor allows for a quick edit of your selected element. It is pretty self-explanatory, but a click on the ‘?’ the button opens a help box explaining all the options. Double-clicking on each element individually will open an element-specific editor box, allowing you to control sizes, colors, fonts, effects and more (editing options differ per element type) of just that element. A range of ‘quick edit’ buttons will also open when certain elements are clicked on, which include the option to animate the element, change links, get help and more. When it comes to editing your site, it doesn’t get much easier than that! TIP: Take note of the header menu as well: the ‘Pages’ menu allows you to change pages within the editor and the mobile phone icon opens the mobile site editor. The preview button opens a (non-live) preview of your site- a tool that should be used throughout your site creation process and not just when you think you have finished. Access over 3,000 digital illustrations, add animation and links to images that enhance your site. Vector art also includes icons, logos, and badges. Now Wix website owners can more easily create web applications and databases to manage their content and tap the power of Wix APIs to connect to external services. Wix users can answer a few simple questions and have a personalized logo built for their company within seconds. Wix Logos come with full usage rights and you can make edits and download your logo free of charge. Wix will automatically generate a mobile-friendly version of your chosen template, saving you time as it uses the exact site content and elements you have edited on your desktop site. As well as doing the mobile-building work for you, the editor offers you complete freedom to edit or even hide certain elements from mobile, without changing the desktop site- a true benefit of Wix’s editor. Background: Change the background image or colors of just your mobile site. Mobile: Here you have a further 3 options for optimizing your mobile site. Mobile View: changes your site layout to ‘Mobile Friendly View’. This ensures your users are fed with a version of your site that is easier to read and engage with (ie. mobile-friendly) rather than viewing the desktop layout on mobile devices. Although you have the option to turn off the ‘mobile-friendly’ setting, this is not recommended. Back to Top Button: Places a small button on your mobile site that allows users to scroll back to the top of the page in one click. Mobile Action Bar: adds a ‘toolbar’ at the footer of the user’s mobile screen with buttons to call your business, see your email/physical address, connect to your business’s social media profiles or open the site menu. Hidden Elements: here you can select the elements you may wish to hide from the mobile version of your site. TIP: The editor automatically optimizes your template for mobile. However, elements that you manually add to your template will not be automatically optimized for mobile (in our case this occurred with an image slider and an Instagram feed). You will have to remember to enter the mobile editor and resize any elements you choose to add to your predesigned template (the actual process of resizing elements for mobile is quick and easy though). TIP: The editor displays your mobile site on an elongated mobile phone, meaning it displays more content in one view than you would actually see on a mobile device, until you preview the site. Keep this in mind if there are certain elements you want to display above the fold- and always double check the display in preview mode. The Wix Mobile App is available for both iOS and Android. One of the standout features of Wix is the Wix App Market- a marketplace of over 250 web apps created by both Wix and 3rd parties. From booking forms to photo galleries, eCommerce to comment boxes and site search to social media streaming – Wix probably has an app to cover all the elements you could possibly want on your website. The majority of apps are free, optimized for mobile devices, customizable and can be added to your site with a few quick clicks. The App Market can be accessed from the editor, in the left side menu. Upon opening the app market, Wix will present you with the top 5 apps for your template/ business type. Scrolling down, you will be presented with a range of categories to further browse the app market. You can also search for a specific app in the search bar at the top. No matter your business type, the Wix Blog creates a dedicated blog page on your site where you can create, edit and schedule blog posts. Posts can be tagged or categorized, include reader comments and images/videos. The blog supports HTML code, meaning it can be customized and has social sharing integration. After just opening the Wix Blog app, a dedicated and nicely structured Blog page is created. The Pro Gallery offers advanced image settings such as image protection, quality and sharpness control, layout, download options and more. Embedded within a page, the gallery can contain images, video and text. In a matter of minutes, you can upload hundreds or thousands of photos and videos and have them displayed beautifully across your site. Wix Stores is a paid, premium app allowing you to add a fully functional and customizable online store to your Wix site in just one click. Create product galleries, manage orders and inventory and offer your consumers a secure checkout process. The premium Wix Stores plans even include 24/7 customer support. The most popular eCommerce plan- ‘Unlimited Store’- starts at US$24.92 per month. Read more about Wix’s eCommerce functionality in our WixStores review. Available in both a free and premium (paid) version, the Wix Bookings App enables customers to easily schedule appointments through your website. The free version allows for simple appointment booking, email notifications and calendar syncing, whilst the premium version (starting at US$9) also allows you to send auto-reminder emails to clients, enables customers to pay for bookings via PayPal or Stripe, handles group and class enrollments and more. This mobile app, available for both iOS and Android users, enables you to do everything from taking online orders, managing to-go orders and customizing menus. You can also display different menus depending on the time of day and add labels such as vegan, vegetarian and more. The 123 Form Builder, recommended by Wix, allows you to create customized forms for lead capture, event registration, newsletter subscription, online bookings, surveys and more. With over 25 types of fields, anti-spam protection and live chat, this is a real ‘all-rounder’ when it comes to collecting user information. The free version allows you to create up to 5 forms and receive up to 100 submissions per month. The premium version (starting at US$3.99) allows you to build up to 8 forms and receive up to 1,000 submissions a month and includes advanced data management, file uploading capabilities, Google Drive integration and more. Found in the main Dashboard, Wix ShoutOut allows you to send your clients business news, product updates, promotions and more by creating tailored email marketing campaigns. Email campaigns can be created from the ShoutOut Editor, where you can customize images, video, text and more. Either add email addresses manually or import your contacts and view the campaign’s results within the ShoutOut Dashboard. Whilst the ShoutOut editor is very easy to use, it doesn’t seem to incorporate the design from your website template, instead offering pre-designed templates or the option to ‘Start from Scratch’. With Wix Events, create and manage all of your events under one roof. You can also set up actions such as ticket sales, add and manage RSVP and set up multiple events/promotions. Along with the RSVP feature, you can send personalized invitations and manage your guest place as well. Users can even manage payment methods and transactions. Wix also offers the ability to build an online community forum. You can even enable users to follow, like, comment and share posts. Site visitors can also sign up for real-time notifications of important company news. Lastly, you can customize your forum with a plethora of layouts. Wix’s platform offers the most comprehensive in-editor support of all the website builders we have reviewed. Within the editor, all help options open as a popup that can be moved around your screen as you continue to edit different elements. Editor Help Center: opens a popup with a list of help categories, or start typing your question and related answers will show up. Keyboard Shortcuts for the Editor: pops up similar to the editor help center. Lists common keyboard shortcuts such as (Ctrl + V = Paste), as well as Editor specific shortcuts (such as Ctrl + J = Switch between mobile/desktop views) which are sure to save time. Step-by-Step Videos: Short videos explaining how to use the Wix editor to add a range of features to your website. Connect a Domain: covers all the topics related to connecting a custom domain to your website, including purchasing a new domain name from Wix or connecting your pre-purchased domain name. Getting Found Online (SEO): another popup, you can watch a video or read about the website elements you can optimize through WIX to enhance your SEO. Whilst support can be received from Wix’s call center (Open Monday- Thursday, 6am- 5pm PST), the platform really does try to solve your problems online to save you the waiting time of speaking with a customer service representative. Wix also has a comprehensive Help Centre with thousands of helpful articles that should answer most of your website-building related questions. The support hub covers topics from ‘How to Begin’, ‘Using Your Editor’ and ‘Mobile Features’ to ‘Technical Difficulties’, ‘Feature Updates’ and ‘Wix App Market’ as well as industry-specific help such as ‘Setting up Wix Hotels’, ‘Wix Pro Gallery’ and more. Before Wix shares their call center’s phone number with you on their contact page, you are asked to answer a short questionnaire regarding the help you are seeking – another attempt by Wix to answer your question without the need to talk to a customer service representative. If your question is still not answered by their system, you are invited to submit a ticket which will be answered online by a customer service rep, or you can request a callback. Premium Plan owners will have their support ticket or request for a callback promoted to a ‘premium’ queue and support requests from VIP users from the US or Canada are handled by Wix’s VIP center. Much has been written about the SEO capabilities of website builders such as Wix, and whilst Wix websites may have experienced some hiccups in the past when it came to Google indexing and ranking potential, a quick check of the current editor exposes a multitude of options to optimize your website for search engines. Getting Found Online (SEO): This SEO tool can be found under the Help menu within the editor. The pop-up allows you to ask SEO related questions as you build your site, watch a video about SEO and follow links to their support center, with guides on how to optimize text, images and more on your site. If you understand the basic concepts of SEO then this may be enough to show you how to edit the main elements. There are also guides to connect your website and submit your sitemap through Google Search Console. Site Manager – SEO: The Site Manager (found under the ‘Site’ menu in the editor) allows you to manage the basic settings of your site, such as domain, mobile and social settings as well as SEO and Analytics integration. The SEO section of the Site Manager allows you to control whether you want search engines to crawl your site (keep this ON for your site to rank in Google search results), add meta tags to the header code, such as for Google Search Console verification, Twitter Cards and more as well as manage 301 redirects from your old website to your Wix site. Page Settings- SEO: When you hover over each page within the Pages menu, a round button appears next to the page name. When clicked, it opens a selection of page-specific settings, one of which is SEO. Here you can control page-specific elements such as title tag and meta description, blog the page from search engines, create a unique URL for the page and even preview that page’s Google results page snippet. SEO Wiz: This step-by-step tool is accessible from the ‘Get Found On Google’ link under the ‘Site’ Menu in the editor, or from your Dashboard (SEO Wiz can be found under ‘My Apps’). Once you enter your business name and 5 keywords that best explain your business offering, the Wizard will create a SEO plan for your website. It highlights what is already ‘SEO- ready’ and what you still need to optimize. By providing instructions, the Wizard encourages you to enter the editor to make these optimizations yourself. TIP: Note that the SEO plan disappears when you enter the editor, so it may be useful to open the ‘SEO Help’ box to guide you along the way. You can return to the SEO plan and find it will keep track of the SEO optimizations you have completed. It is important to note that SEO success is not primarily dependent on the builder you use to create your site, rather the actions you take to best optimize your website. Optimizing your site for both search engines and users is the key to ranking well in Google and requires research, planning and- in terms of using Wix- a small investment of time to complete all the SEO tools mentioned above (an investment that will reap you big rewards in terms of rankings and SEO). All sites created with Wix are automatically given a Wix URL under the format: username.wixsite.com/sitename/page-url. Free accounts maintain this domain/ URL structure, but we recommend upgrading your account to connect a custom domain to your site. Upon publishing your new site with Wix, you have the option to either transfer a pre-purchased domain name, or purchase a domain from Wix. 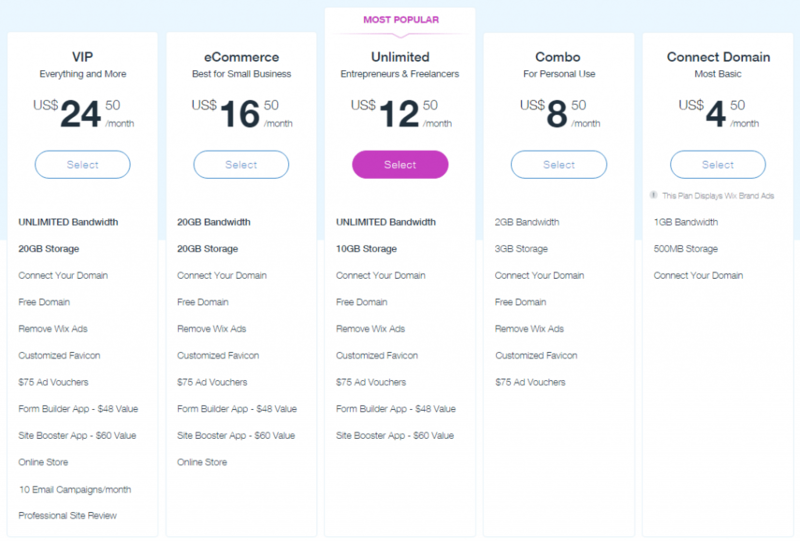 You can either connect (domain remains hosted at current domain host) or transfer (Wix becomes the domain host) your domain to Wix – both options require a premium plan. Easy to follow instructions for both options can be found in Wix’s Help Center. Domains can be purchased from Wix outright, but you will need to upgrade to a paid plan in order to connect it to your site. .com/ .net / .org domains purchased outright cost approximately $15 a year but can be pre-paid for up to three years at a discounted price. .com / .net / .org / .info / .biz / .co.uk domains are included for free for one year in all yearly plans except for the basic ‘Connect Domain’ plan (see below for more details on plans). Wix domains can be transferred to an external site (away from Wix). The process can be done after 60 days from the domain purchase date and usually takes 7 days. ‘Free’ Wix hosting is included with all plans. The amount of bandwidth and storage available increases as the value of your selected plan increases. The most popular plan -‘Unlimited’- offers 10GB of storage and unlimited bandwidth. See plans below for further details about storage & bandwidth options. * Whilst some other platforms do allow you to export your website, it is important to note that Wix does not offer this capability. Wix offers five core plans to choose from, ranging from $4.50 a month to $24.50 a month. When comparing the features and benefits of each plan (both between each Wix plan and against other website builders’ plans), it becomes clear that Wix’s plans are fairly priced, offering the best value for money to users. For a complete breakdown of Wix costs, read our Wix pricing review. See the image below for a brief overview of all yearly plans (prices shown are per month). These costs alone would easily amount to more than $12.50 a month, more likely in the hundreds of dollars a month. Note that when you first sign up for Wix, you can open a free account, meaning there are no monthly fees. Although free account users have access to Wix’s full image library, the Wix App Market and support resources, they are limited with just 500MB of storage, Wix logos displayed across the website and a non-unique domain name (following the format: username.wixsite.com/sitename/page-url). We recommend using the free account whilst you build your site, but upgrading to one of the above-mentioned plans when you are ready to go live. 3rd party chat apps available. Some only available on premium plan. With over 80 million websites created, Wix’s editor is constantly evolving and new features and updates are announced on a monthly basis. Once your site is live, you can still add apps and new features to meet your changing business or user needs. For example, if you wish to open an online chat feature, this can easily be achieved by adding one of Wix’s chat apps; if you wish to open an online store, you can add the Wix Stores app to your site (you will also be required to upgrade your site to an eCommerce Premium plan). If a feature you need doesn’t exist or does not perform to your expectations, it’s possible Wix is already working on an update, depending on how important it is to their users. This exemplifies that Wix really is doing a great job of listening to its customers. In most sections within the Help Center, there is a “Feature Requests” category which lists potential improvements to Wix elements and features. Based on the number of user votes, Wix may fix or update a specific feature in the future. One of the main drawbacks with Wix however, is that once you have selected your template, you can not change it (both before and after publishing your site). Changing to a new template would require you to manually copy and paste all the content between templates – an incredibly time consuming process. And whilst you can transfer your domain name away from Wix, you can not automatically transfer your site content to another platform- such as WordPress or another website builder (builders such as Weebly and Squarespace do offer this option). Again this would require a great amount of time to manually copy and paste site content from one platform to another. Wix ticks all of the boxes when it comes to the full website building process. From templates to website elements, domain names to payment plans, Wix offers the widest range of options for all business types. And whilst you will need to spend the time to fully grasp Wix’s editor, it is just another sign of the consistent improvements and addition of new features that Wix works hard to offer- something that all users benefit from. Wix Code gives users access to their site’s code to make advanced customizations to their site. Widest range of professional-looking templates, as well as a blank canvas editor for design flexibility. Wix constantly updates its website builder with new elements, tools & features. Comprehensive app market full of add-ons & integrations to enhance your website. You can not change your site’s template after you begin editing your site. Wix does not offer content export functionality. Some users may be overwhelmed by Wix’s huge range of features – users should be prepared to take the time to learn & understand the platform before building their website. Have Experience With Wix? Share it!